I’m wondering if I have found the UK’s first ever fabulous person who, self-described as “Designer” on a Census? But my favourite Census find is the French-born Mlle. Elanore Riego de la Branchardiere. Which is so ‘Scarlet Pimpernel’ a name, I had always assumed it was the fancy pen name of say, Sally Smith from Croydon. Imagine the excitement to find her on New Bond St in 1851, at a rather grand address. She is having none of this nonsense about being a mere wool dealer, either. You can find Mlle Riego de la Branchardiere’s books here. William ran away to join up and was fetched back home, at least once. This picture was said to have been taken from his body. There is indeed a suspicious looking stain on the back. Someone used a pin to make perforations, presumably to mount the picture in a circular frame, but that never happened. I inherited the photo when I was still a child. 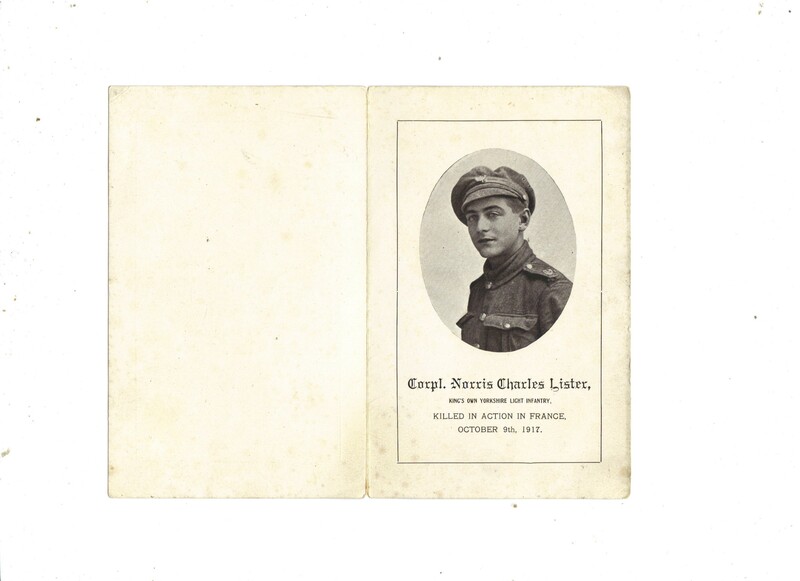 He died on the Marne, in the spring of 1918, and his body was never recovered. He is remembered on a memorial in Soissons cathedral. His younger sister, Lillie, was my grandma. 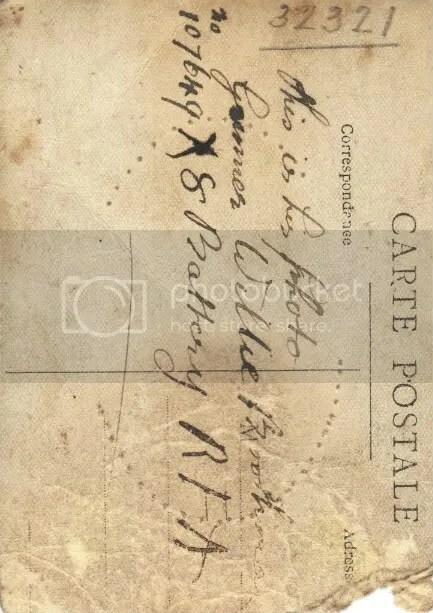 We have no way of knowing if the handwriting on the reverse of the carte postale was Willie’s, or someone else’s. When my oldest son, Will, was born on a Remembrance Sunday, we named him after my great uncle. My father’s middle name was also in memory of him. Had he lived, William would have inherited his father’s business, a large dairy in North Leeds. William died during an action, and it was quite common for photos, money and other belongings of the soldiers to be gathered up, before they went over the top, in case the worst happened. Then their things would be shared amongst their surviving friends, or sent back home to Blighty. 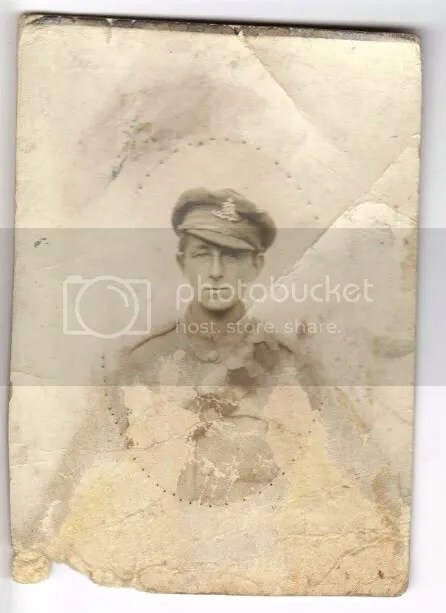 I can remember looking at this picture as a kid and wondering about those moments of boredom, maybe, when Willie sat in a trench with that pin, making the perforations round the photo, so he could frame it, and send it home to the family. The fact it came down to my grandmother, his younger sister, is interesting too. Family legend had it that Lillie was the closest to him of his three siblings; and this would be borne out by the fact the photo came to my father, rather than his cousins. Look closely, and you can see the ciggie behind his ear. He looks like a jaded, middle aged man in the final photo, but he died aged only nineteen or twenty. It’s quite salutary to compare him to the fresh faced youth, about to go to France, in this earlier photo. He is pictured with his sisters, Nellie and Lillie, and younger brother, Leslie. As it is an ‘official’ family shot, we know he had already run away and been brought back, so had seen some action already even as that fresh faced young lad. The two photos can only be 2 or 3 years apart, and yet could be twenty years apart, seeing how much he aged between the two shots. This may well be the last photo my grandma had of herself with her big brother. (She is the little girl standing, on the right). All four of the Boothman children’s faces look grim or apprehensive. They knew that he might never be coming home, this time. I have a draft of a letter written by Willie’s dad, to his Commanding Officer, saying his son had run away underage, and could the Army please send him back, is how we know it is not an apocryphal story that he ran away to join the RFA. The letter was addressed to an officer at Imphal Barracks, here in York. Family tradition has it that Willie was indeed sent home to Leeds, only to join up once more, the moment he reached 16. My grandfather was another Leeds lad who ran away – in his case, aged only 14 – to the Front. His first day of action, incredibly, was the First Day of the Somme (or so his brother once told me). He was a bugle boy. 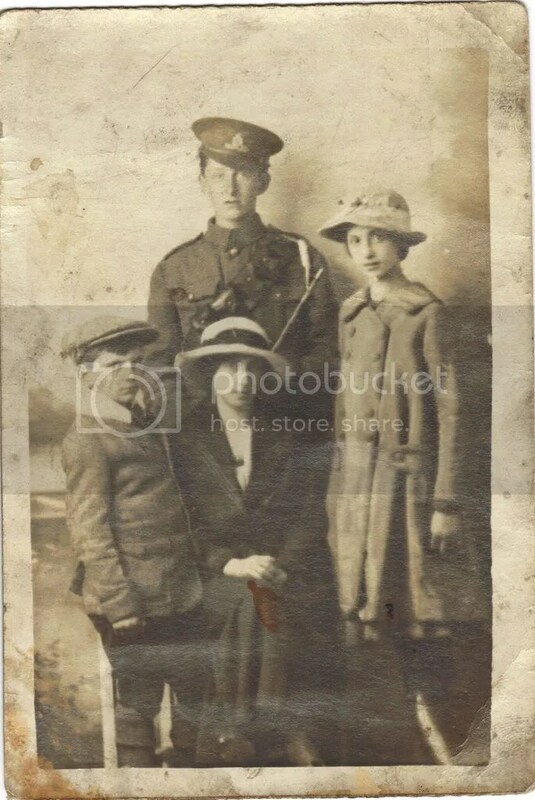 Both my dad’s parents lost a brother in WWI. 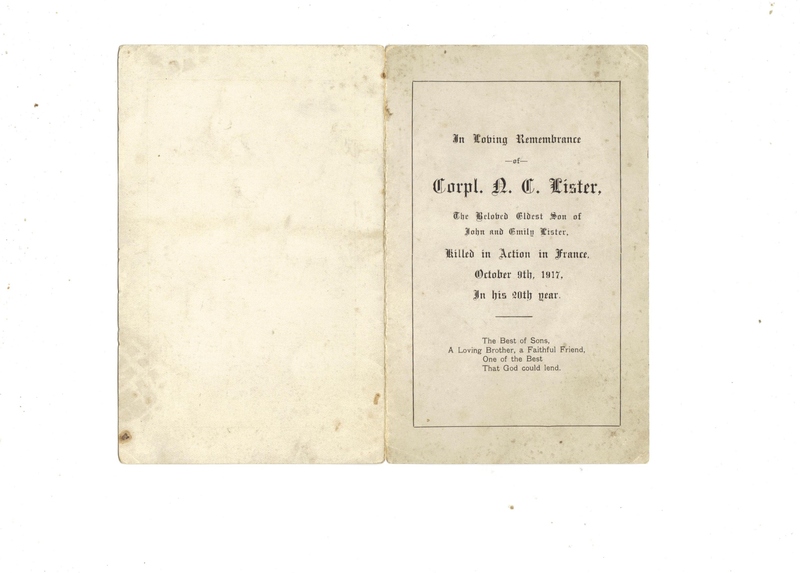 My grandad, as my grandmother, also lost his older brother, Cpl Norris Charles Lister, of the King’s Own Yorkshire Light Infantry. and well regarded NCO. Like my grandad, he was a keen musician, playing the viola and, I think, the piano. He looks uncannily like my father did, too. A few months before he died, he was offered a commission. He turned it down. He wanted to stay with his men. Sometime in September, 1917, he was sent home for three weeks on leave. When he arrived home in Leeds, he was so yellow and jaundiced from exposure to mustard gas, the family literally dragged him to St James’ Hospital, in Leeds, for some medical attention. The doctors there sent him away with a flea in his ear, assuming he was trying to “swing the lead”. In fact, he had every intention of returning to the Front and had been compelled to see the doctors, by his parents. The week of the infamous mutiny in the British Army camp, Etaples, he passed through it on his way back to the front. We can’t know what he saw (or whether he participated) but like all the witnesses, he was packed off to Passchendaele, where he was killed on the morning of an action, in October, 1917. He was added to the memorial, and for some time was the final name on his section. I’m sure more have gone on since. My Great Uncle Jack told me that my grandad, only a year younger, had run off to join the army underage, just to be near Norris. Although he joined the West Yorkshires, not the KOYLIs. He also said his mother refused, to the end of her days, to believe her beloved oldest son was dead. She always left a light on in the kitchen for him, in case he came home in the middle of the night. She was visited, after the War, by his friends, who told her that he had died pulling a comrade from the barbed wire. He had died quickly, mercifully, been picked off by a sniper. My father and grandad, later soldiers themselves, grew sceptical about this account, however. They realised it was what soldiers said to their mates’ mothers, to ease their pain. Of that generation of my family, three went to War and only one (grandad) returned. He stayed in the TA, between the Wars and so was called up back into the West Yorkshires, on the day WW2 was declared. There, his unit helped out with firewatch in London during the Blitz; later amongst the British troops liberating Belsen. My grandfather was there from the First Day of the Somme, through many actions, into a second War, and amongst those men bearing witness in Belsen. He would never speak about that. Not even to my dad after he too had been a soldier. He became a Sargeant. Remembrance Sunday is, for me, to remember the loved ones who survived, as well as those who were killed. They are all gone now. All of them. Sleep tight, lads. So long as there are stupid, vain politicians – there will be wars. We must never forget these men, even though they have. I will leave you with the words of another Leeds lad – my favourite War poet, Isaac Rosenberg. What quaver – what heart aghast? 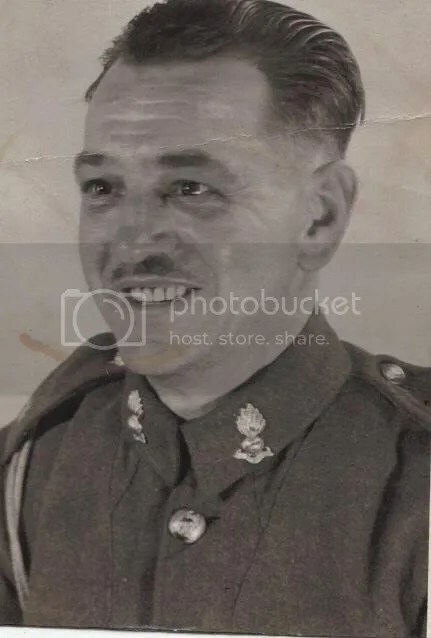 My grandad in WW2, Sgt Billie Lister.